The Stayback Tee is designed to teach and practice the rotational method of hitting that can double bat speed. STAY BACK TEE The Stayback Tee is designed to teach and practice the rotational method of hitting that can double bat speed. 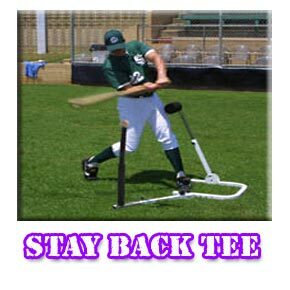 The Stayback Tee trains the hitter to keep the weight coiled on the back leg and hip longer. This allows the hitter to adjust to different pitches and maximize the power from leading with hips and turning into the ball. Made of solid metal construction with replaceable tee. Converts to left handed easily and adjusts to any size player. Designed with a safe padded frame so it can be used on any surface indoors or out. Breaks down in seconds, making it very portable. Training CD included.